Customise vanilla ice cream with traditional Christmas flavours for a lighter finish to your festive feast. You will need a freezer-proof pudding basin large enough to hold the ice cream. * Wash the tangerines in warm water and dry them with a cloth, to remove any chemical residues (you are going to be eating the skin). Cut each tangerine into 6-8 fine slices. 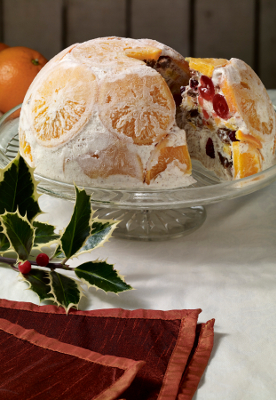 * Put the tangerines into a large saucepan with half a litre of water and the caster sugar. Bring the mixture to boiling point, then simmer for 15 minutes until the liquid is reduced and the tangerine slices are soft. * Take the pan off the heat. Using a slotted spoon, carefully take the tangerine slices out of the pan and transfer them to a plate to cool. Arrange approximately half of the tangerine slices around the sides of the pudding basin, pressing them down so that they don’t slide. Chop the slices that are left over and add them to the ice cream mixture. * Carefully spoon the ice cream into the pudding basin and put it into the freezer for at least 12 hours. * When you are ready to serve the ice cream, take it out of the freezer and dip the basin into a sinkful of lukewarm water for a few moments. Turn the ice cream out onto a serving dish.